Description: This nature inspired pendant depicts a majestic Bear meandering through entangled trees in an enchanting forest as the warm summer sun beckons in the background. Beautiful ambient light is emitted through stunning Amber Mica, which is enhanced by accents and frame featured in a Textured Black finish. 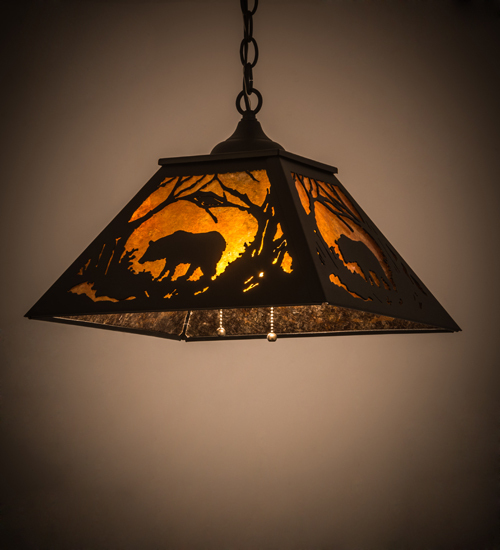 The fixture is handcrafted by highly skilled artisans in our manufacturing facility at the foothills of the Adirondack Mountains in the USA. Custom designs, sizes, colors and dimmable energy efficient lamping options such as LED are available. This pendant is UL and cUL listed for dry and damp locations.